This past Saturday, Saturday Dinner Out was at a place we haven't been to in a while: Max's Allegheny Tavern. I had been in the mood to try it again and then my mom asked me about it because she & dad were interested in trying it but unsure of where exactly it is and wondering how the food is. So we made plans to go to their place after our nephew's birthday party and then go to dinner. For drinks, I had fresh iced tea, mom had pinot grigio, dad had a Spaten, and SP tried the beer sampler. Everyone had Fresh Spinach Salad with Max’s Hot Bacon Dressing (crisp leaves of spinach garnished with slices of mushrooms, onions and hard-cooked eggs. 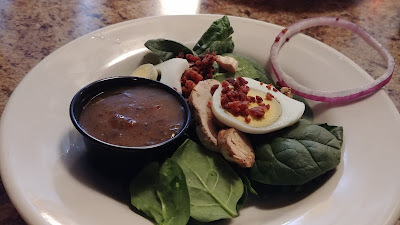 Topped with our own hot bacon dressing.). This salad is just as yummy as I remember. Everyone liked it and mom said it was just like the one she makes but the dressing was much tastier than hers! 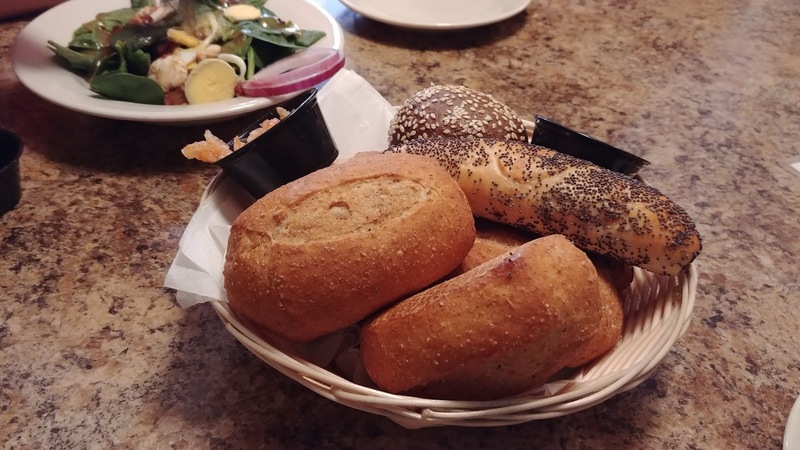 Bread basket with a cabbage spread and apple butter. 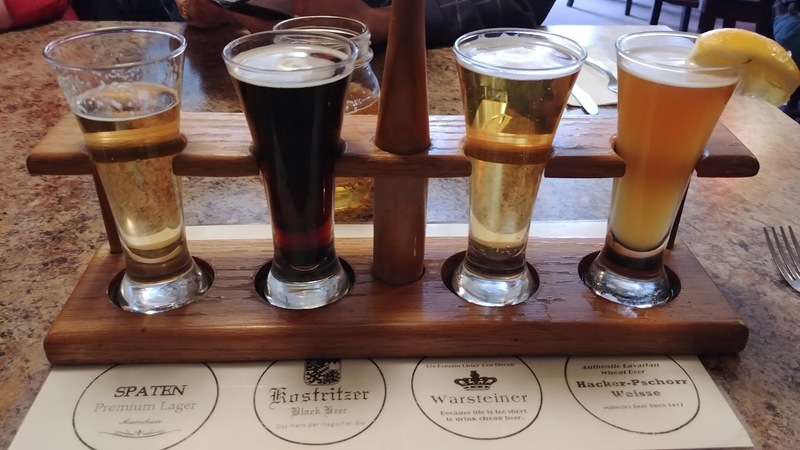 I ordered the sampler platter. I chose (from top of plate left to right) Count Esterhazy Schnitzel (Vienna-style veal lovingly crowned with a sauce of fresh mushrooms, peas, sour cream, onions and carrots), Chicken Viennese (boneless chicken breast delicately fried to a golden brown. Topped with a sauce of sour cream, finely chopped vegetables and delicately seasoned with herbs and paprika, served over our homemade spatzle), and Jäger Schnitzel (Vienna-style veal covered with a delicious mushroom sauce). My mom had the Jäger Schnitzel for her meal. For my 2 sides I chose potato pancakes with sour cream and German potato salad. I really like the potato pancakes. I like the potato salad, but the sauce it a lot sweeter and tangier than the sauce we make for German potato salad. SP also chose the Sampler Platter. He chose Baked Kassler Rippchen (smoked pork loin chops slowly simmered in our homemade sauerkraut and served with mustard sauce), Chicken Viennese, and Leberkase (finely textured sausage loaf made from a blend of pork and beef, seasoned with spices imported from Bavaria. We grill each slice lightly and serve it smothered with sauteed onions). He said it was all delicious. 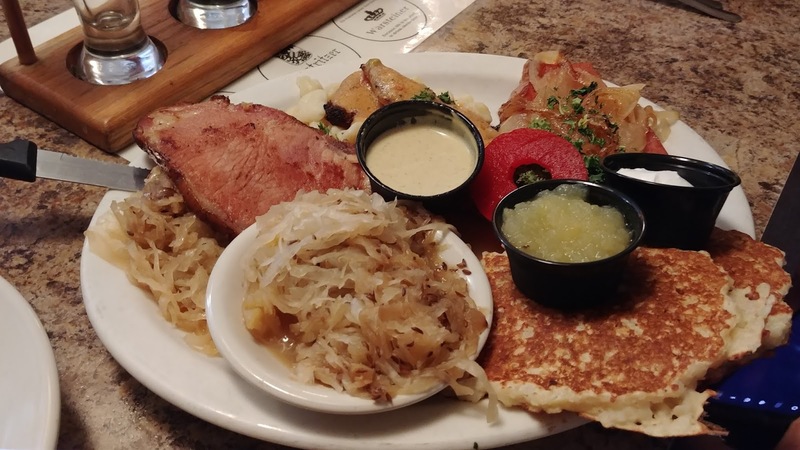 My dad had the roast pork for his meal: Roast Loin of Pork Stubenkuchen Style (this all-time favorite at Max’s is served over our special recipe apple raisin dressing and topped with a rich brown gravy). He must've liked it because he ate it all. 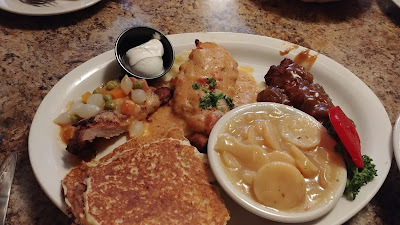 Everyone had potato pancakes and SP was the odd one, choosing sweet & sour cabbage (the rest of us had potato salad). We shared 2 desserts. 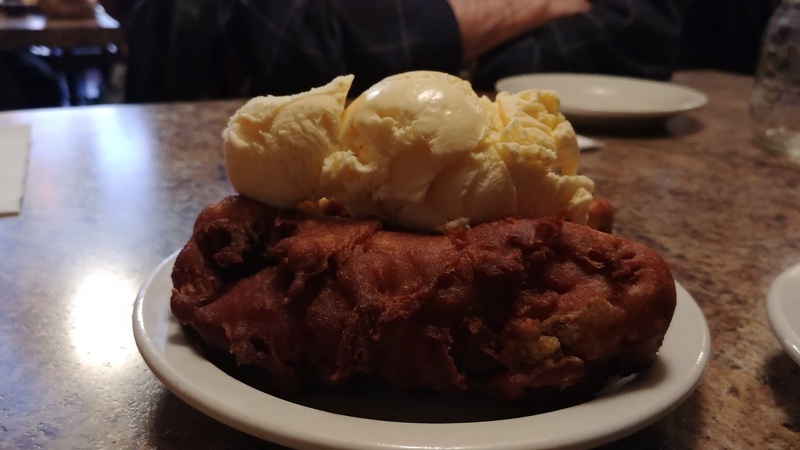 Apple Fritter with ice cream, above. And Black Forest Cake. I'm not sure which I like better! The fritter is fried dough with melty ice cream while the cake was chocolate and light, not dense, and the chocolate filling was really, really good. 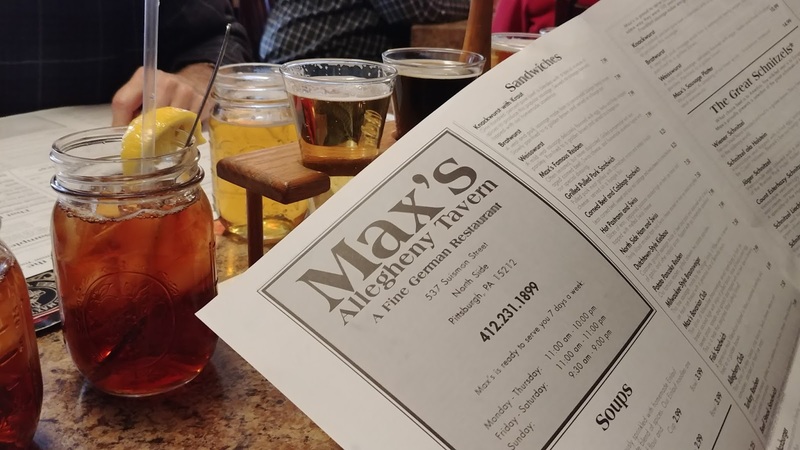 We all enjoyed our food at Max's. Parking is street parking, but it wasn't hard to find a spot. There is a smallish step to get inside, but they have a portable ramp they'll put out. Our server was very friendly and helpful. 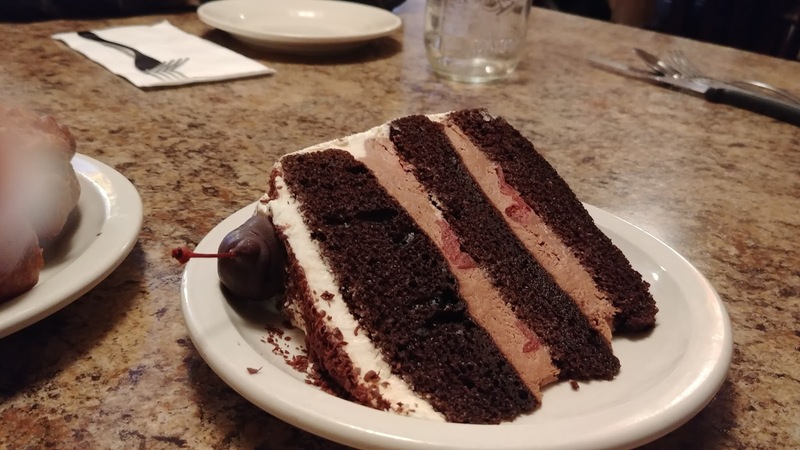 She gave us plenty of time to take in the whole menu (which is printed inside a newspaper) and then decide what to order and described a couple other desserts for us since they all sounded really good. The receipt says her name was Jamie, which is a little funny because the nephew with the birthday party is called Jamie, so it was a day of Jamies. 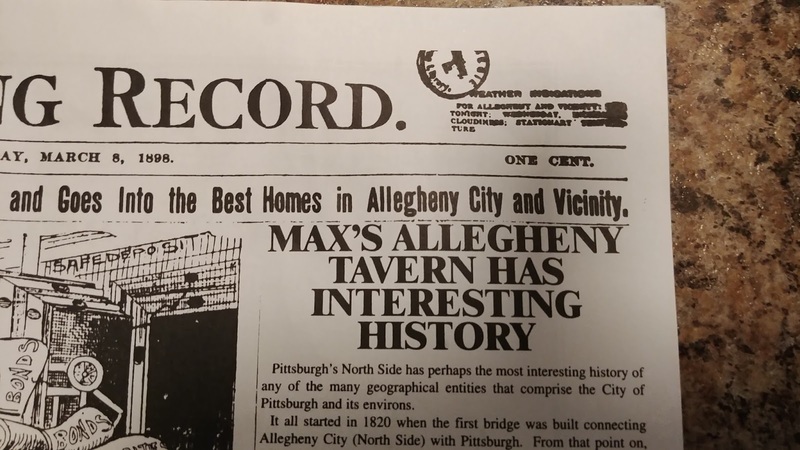 I like Max's a lot. I like the casual atmosphere, the history of the building, the old Deutschtown feeling/decor with floral wallpaper, dim lighting, old framed photos, a cuckoo clock. The food is basic German, hearty, filling, and tasty. Definitely a good choice on a chilly day.